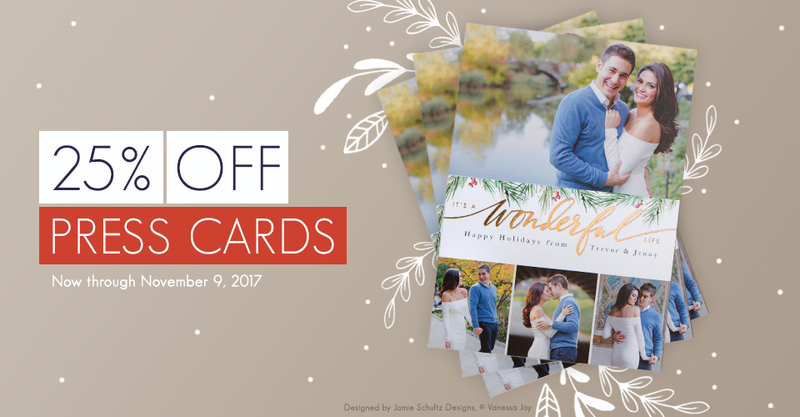 Now through November 9th, enjoy 25% off Press Cards in ROES and Designer Plus (no code required). Celebrate the holiday season with stylish greetings printed on premium papers. From Foil to Luxe, you have an endless array of options to bring your vision to life. As always, you will receive your order in as little as 1-2 business days with free overnight shipping. If you like the design above, it’s available as free PSD download (along with other designs) through November 13th. Please Note: This offer applies to Accordion Cards, Flat Cards, Flat Luxe Cards, Foil Pressed Cards, Folded Cards, Folded Foil Pressed Cards, Folded Luxe Cards and Luxe Pop Cards through ROES and Designer Plus. All Business Cards are not eligible. The sale price will not be reflected in order summaries or email confirmations. The discount will only appear after the order is transmitted and received by the lab. Offer expires at 11:59 p.m. on November 9th. Standard license prohibitions apply: You may not resell or redistribute this template in whole or in part for any reason, claim these designs as your own or use the designs for use in logo, business card, branding or web design. Download formatted for ROES or Designer Plus.